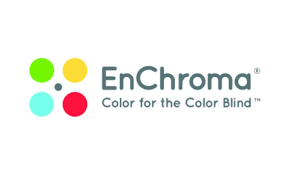 We’re proud to announce that Long Island Opticians has been selected as an authorized reseller of EnChroma color enhancing glasses. Please visit the EnChroma website to view the latest information on this exciting and revolutionary technology. No appointment is necessary to try on an Enchroma Demonstrator. We do advise that you should take the Enchroma Online Color Test before you come in. Please record the results of that test as it will help us to better guide you through your initial Enchroma experience. We Now Have In Stock Non-Prescription Enchroma Indoor and Outdoor Lenses! We have a loaner program built around the Enchroma “Receptor” fitover model that allows people to take a deep dive of 10 days into the world of EnChroma color enhancing technology. This is done exclusively in the office and not via the mail. The loaner is paid for at $329.00 (plus tax) and is refunded in full at the end of the trial period when the loaner is returned within the 10 day trial period. NOTE: Enchroma color enhancing technology is not restorative in nature. It is not meant to assist a color deficient person with passing a screening test for color blindness.